Lifting and illuminating effect. Fortifies lashes. 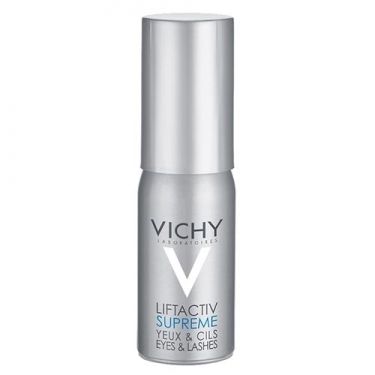 Liftactiv Supreme Yeux & Cils from Vichy is a serum for the eye contour that returns the youth to all women from 35 years. Formulated with Rhamnose, a concentrated molecule of plant origin that fights skin aging, ceramides, natural constituents of young eyelashes, and micro reflective pearls that instantly brighten the look. For a lifting effect, fortified eyelashes and immediate brightness. Enriched with Vichy Thermal Spa Water known for its soothing and regenerating properties. The texture is fresh and fondant. Ophthalmologist tested and dermatologically. Hypoallergenic and paraben free. Apply a drop of serum on your fingertips. Close your eyes and gently apply around the eyes. Eyes closed, over the entire area of the lower eyelid spread the inner corner to the outer corner of the eye, including the eyelids. To end with eyes closed, place the indicator on the edge of the eyelids and slide the indicator to the tip of the lashes.